This study was to investigate a dental unit chair waterline control status and management method. A survey was conducted among 311 persons who were employed in dental and medical institutions in Busan, Korea from March 16 to April 15, 2012. Statistical analysis was performed using SPSS 18.0 version. Micro culture was implemented 10 dental unit chair randomly. For testing, dental unit waterline flushing from a regular chair was completed at once, for 1 minute, 3 minutes, and 5 minutes. Another flushing was completed dental unit chair equipped with plasma sterilization system. In terms of waterline control behaviors, 23.5% dental hygienist do regular microbiological test. The most significant reason for not performing regular microbiological testing was ‘Others’. The microbial culture result of dental unit chair waterline was shown by flushing time. The number of microorganisms in the 5 minute flushing was significantly reduced. The flushing with plasma device was not detected at all. Thus, the longer the waterline flushing time is, the higher the management effect is. The best way is to use effect equipment. Finally, realistic control training to enhance the dental hygienist’s control ability must be required. In dentistry, the unit chair is the most basic equipment for dental treatment and has been gradually developed over the last 40 years in terms of its appearance and . The waterline of the unit chair serves to supply water to the apparatus connected to the unit chair, the mouthwash system, and the cuspidor . If the patient’s saliva or blood, however, flows backward during the unit chair’s operation, not only the backwash point but also the waterline through which the water passed is contaminated, creating an environment where bacteria can easily reproduce. The safety of the patients and employees in dentistry is closely related to the amount of microorganisms in the water used in the unit chair . Since bacterially infected water from the unit chair may work directly or indirectly in the mouth, it is recognized as a risk factor for systemic diseases as well as oral diseases . Bacterially infected water from the unit chair can cause serious infections especially in the elderly and immunocompromised patients and can lead to conjunctivitis as well as to respiratory-related diseases and bowel disorders. Thus, attention must be paid to it . For this reason, the bacterial infection of water to be used for dental patients has been adopted and evaluated as a waterline and surface management item in relation to the evaluation of dental care institutions’ infection control that is currently being conducted . The microorganisms present in waterlines biofilms, which are microbial colonies grown on the surface. These biofilms cause opportunistic pathogens like pseudomonas aeruginosa, legionella bacteria, etc. . Once formed, biofilms are very difficult to completely remove, and it takes much time and effort to prevent their infection. Waterline management is an infection control method that periodically disinfects the water bottle dedicated to the water supply from a handpiece, air and water sprayer, etc., removing the microorganisms that flow backward to such water bottle so that they would not be able to form biofilms on the wall of the water bottle by hiding in the slime , which has become a hot topic in dentistry of late. In the United States, the Centers for Disease Control and Prevention (CDC) and American Dental Association (ADA) recommend a 500/ml maximum live bacterial level in the dental unit waterline  and a 200/ml colony-forming unit (CFU) , respectively. 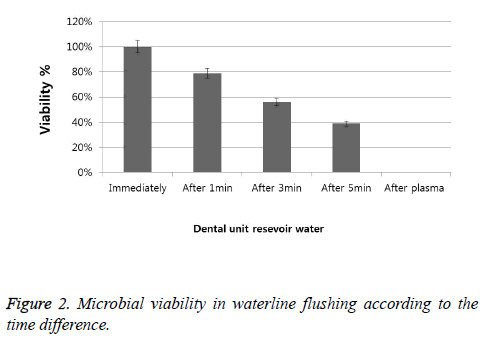 South Korea’s guideline for waterline management, however, is known to recommend a less than 100/ml maximum live bacterial level in the dental unit waterline, which is difficult to implement overall due to the implementation agency’s lack of understanding of the pertinent management method . Various methods of inhibiting the microorganisms that have proliferated are currently being carried out. Different methods have been applied in different hospitals, including the nonchemical method of flushing water from the waterline to lower the level of microorganisms, the use of chemical anti-infective agents, the use of a waterline biofilm treatment solution, treatment of water before supplying it to the unit chair, and the use of other equipment [11,12]. In addition to the management method applying microbial inhibition using chemical inhibitors or equipment, changes are also needed in the dental hygienists’ waterline management awareness level because such dental hygienists are the people who are actually responsible for managing the waterlines according to the established guideline. Therefore, this study aimed to quantitatively analyze the bacteria in the water through the dental unit waterline flushing method and the use of waterline management equipment, and to review the feasibility of the method and to suggest an easier waterline management plan by investigating the awareness of waterline management and the method employed for such by dental hygienists engaged by dental care institutions to perform the waterline management tasks. This study was conducted on 311 dental hygienists employed in dental care institutions in Busan, South Korea. To determine the dental hygienists’ level of awareness of dental unit chair waterline management as well as the status of and obstacles to their implementation of such, a survey on the status of and obstacles to the implementation of dental unit chair waterline management was conducted in this study, among the infection control indices of the evaluation criteria employed by dental care institutions and formulated by Korea Institute for Health and Social Affairs in 2010. For this study, five regular unit chairs and five unit chairs equipped with a plasma sterilization system (Dentozone, Seoul, South Korea) were randomly selected from a university hospital located in Yangsan. To perform microbiological testing, flushing was completed at once, for 1 minute, 3 minutes, and 5 minutes, and 30 mL water was received in a sterile container, which was subjected to microbiological testing (Table 1). An mL of each sample obtained by flushing was applied to a 3 M petrifilm plate (USA). The films were cultured in an incubator at 37°C for 48 h. The microorganism CFUs cultured in the film were measured and calculated. The SPSS statistical program (Version 20, SPSS, Chicago, IL, USA) was used for statistical analysis, and frequency analysis was performed with the frequency and percentage for the status of and obstacles to the implementation of dental unit chair waterline management. Additionally, to check the bacterial propagation in the water, the difference in CFU between the groups was analyzed through the Student t-test at a 95% significance level. In the survey that was conducted to examine the respondents’ waterline management behaviors, 23.5% of the respondents answered that they do regular microbiological testing for waterlines. Of those, 38.8% were dental hospitals and 9.8% were dental clinics, and the difference was significant (p<0.01). For handpiece waterline flushing, 45.3% answered “always do” (the most common answer), and the implementation rate was 55.8% in dental hospitals and 36% in dental clinics, indicating that the implementation rate is higher in dental hospitals. For ultrasonic scaler waterline flushing, 44.4% answered “occasionally do” (the most common answer), and the implementation rate was 40.1% in dental hospitals and 48.2% in dental clinics, indicating that the implementation rate is higher in dental clinics. For three-way syringe waterline flushing, 44.1% answered “occasionally do” and 27.7% answered “always do.” In the results by medical institution, among the respondents who answered “always do,” 32.7% were dental hospitals and 23.2% were dental clinics, showing that the implementation rate of three-way syringe waterline flushing is higher in dental hospitals (Table 2). In terms of the reason for not performing regular microbiological testing for waterlines, 49.2% answered “others” and 31.5% answered “hassle during the procedure” (Table 3). Table 1: Divided group of flushing in this study. Table 2: Implementation status of dental unit chair waterline management by medical institution. Table 3: Reasons for not performing microbiological testing for waterlines. The results of waterline flushing according to the time difference are shown in Figure 1. When the water was flushed at once, many microorganisms were observed on the film, and the number gradually decreased when flushing was carried out for 1 minute, 3 minutes, and 5 minutes. On the other hand, when the plasma sterilization system was used, microorganisms were not detected (Figure 2). The number of microbial colonies was also counted and compared, and the results showed that it significantly decreased in each group (Table 4). Table 4: Antibacterial activity of dental unit control status. 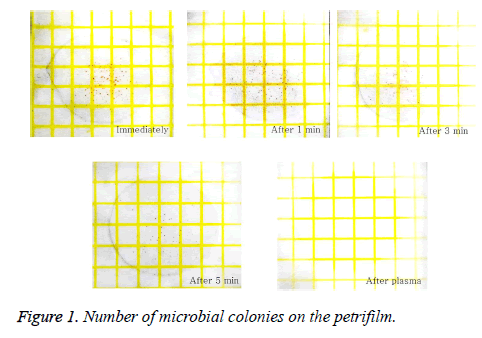 Figure 1: Number of microbial colonies on the petrifilm. Figure 2: Microbial viability in waterline flushing according to the time difference. The relationship between the biofilm and the bacterial proliferation in waterlines or storage tanks is an area of interest that has been in the spotlight of late, and secondary problems like cross-contamination occur. Thus, dental unit chair waterlines need to be thoroughly managed by developing a safe management method. This study was conducted to investigate the dental hygienists’ waterline management behaviors and the obstacles that they encounter when implementing waterline management at the treatment rooms, and to provide visual data for improving the level of infection and the infection control plan by confirming the water quality of the unit chair through microbiological testing. Microbial infection of the waterline of the unit chair was first reported by Blake . In the waterline structure of the unit chair, biofilms can be formed quickly . First, the intermittent use pattern of the dental line leads to the stagnation of the whole water column inside the waterline during the day, thereby activating the microbial growth in the water. Second, according to the physics of laminar flow of the water passing through the waterline, the flow is maximum at the center of the lumen and minimum at the periphery, facilitating both the deposition and attachment of microorganisms to the tube surface [15,16]. Furthermore, it is known that the average temperature of the water in most waterlines is 23°C, which is a good condition for microorganisms to reproduce . Previous studies have highlighted the importance of water quality in the waterline of the unit chair to protect the dental patients and employees [18,19]. Robert et al. examined the awareness of the infectious risk associated with the water in the unit chair and reported that only 30% of the dentist respondents in their survey answered that the water circulating in the dental unit chair waterline transports many microorganisms, and that the dental patients and employees are thus at risk for infection. In the survey that was conducted in this study, however, which investigated the implementation rate of waterline flushing through a handpiece, an ultrasonic scaler, and a three-way syringe, a larger number of dental hygienists answered that they do flushing, implying that the role of dental hygienists in managing the medical equipment in dentistry is greater, and that they are more aware than the dentists of the need to manage the medical equipment in dentistry because they are the people who actually manage the equipment. Nevertheless, in terms of the reason for not performing regular microbiological testing for waterlines, “do not know well,” one of the “other” opinions, was the most common, consistent with the results of other studies . The reason for this seems to be that there is no clear management guideline for the waterline management of the unit chair, and that the waterline management of the unit chair is thus entrusted to each medical institution and there is no institutional device related to its non-fulfillment. The typical methods for unit chair waterline management currently include using medicinal materials and disinfection equipment. For the medicinal materials to be used for disinfection, a variety of products containing NaOCl and H2O2 have been developed and are currently being used to inhibit the microorganisms in the waterline [9,21]. When these chemicals are used, however, the residual medicine components after the treatment must be discharged through idling when the equipment is re-operated, which is inconvenient. For that reason, waterline flushing, a basic management method, is the most well-known method of reducing the microorganisms formed in the waterline [2,12]. According to the experiment that was performed on such, the microbial levels of the water collected at once and in the 1-minute flushing from the unit chair exceeded the reference value, and it was confirmed to be less than the acceptable reference value at least after 3 minutes. Waterline management through waterline flushing has the effect of reducing the amount of microorganisms in the discharged water, but it could not completely inhibit the microorganisms therein. Besides these, in recent years, water purification systems using various disinfection equipment were frequently used [7,22]. In this study, the method of inhibiting the water microorganisms of the unit chair equipped with a plasma sterilization system was adopted. This method has been reported to have a strong OH and O sterilizing power produced by the decomposition of O2 and water as plasma is generated [23,24]. It was confirmed that microorganisms were not detected at all when the plasma purification system applied in this study was used. The reason for this is not only that the plasma sterilization system has a strong OH and O sterilizing power but also that it is attached to the unit chair, and as such, the microorganisms are filtered through the water filter. This study had a limitation, however, in that unit chairs equipped with an uncommon plasma water purification system were used for the experiment and various dental treatment chairs were not reflected. Therefore, the difference in the microorganism expression rate within the waterline of the unit chair needs to be investigated by each area of care in the future. Additionally, this should lead to further studies to systematize the water quality management method according to the area of care. This study aimed to know the method for unit chair waterline management. According to this paper, dental employees need to clearly recognize the risk of infection and to define efficient and proper management methods for implementation. Moreover, systematic education and awareness change are required. To do this, visual stimulation should be provided by presenting scientific and effective evidence, and appropriate control methods should be taken based on such. This work was supported by a 2017 research grant from Youngsan University, Republic of Korea. Coleman DC, O'Donnell MJ, Shore AC, Swan J, Russell RJ. The role of manufacturers in reducing biofilms in dental chair waterlines. J Dent 2007; 35: 701-711. Coleman DC, O'Donnell MJ, Shore AC, Russell RJ. Biofilm problems in dental unit water systems and its practical control. J Appl Microbiol 2009; 106: 1424-1437. Pankhurst CL, Coulter WA. Do contaminated dental unit waterlines pose a risk of infection? J Dent 2007; 35: 712-720. Szymańska J, Sitkowska J, Dutkiewicz J. Microbial contamination of dental unit waterlines. Ann Agric Environ Med 2008; 15: 173-179. Lee SS, Kim DA, Song SS, Kim MY, Shim HN. Awareness and practice of dental unit waterline management in dental hygienist. J Korean Soc Dent Hyg 2016; 16: 507-516. Shin HS. Dental hospital accreditation demonstration project. Korean Inst Health Soc Affairs 2009; 148: 64-75. O'Donnell MJ, Boyle MA, Russell RJ, Coleman DC. Management of dental unit waterline biofilms in the 21st century. Future Microbiol 2011; 6: 1209-1226. Cha SR, Kim KJ. Protocol for disinfection and sterilization in dental clinic. J Kor Dent Assoc 2013; 51: 130-137. Centers for Disease Control and Prevention. Guidelines for infection control in dental health-care setting. MMWR 2003; 52: 28-30. American Dental Association. Statement on dental unit waterlines. J Am Dent Assoc 1996; 127: 185-186. O'Donnell MJ, Boyle M, Swan J, Russell RJ, Coleman DC. A centralised automated dental hospital water quality and biofilm management system using neutral EcasolTM maintains dental unit waterline output at better than potable quality: a 2 year longitudinal study. J Dent 2009; 37: 748-762. Rice EW, Rich WK, Johnson CH, Lye DJ. The role of flushing dental water lines for the removal of microbial contaminants. Public Health Rep 2006; 121: 270-274. Blake GC. Incidence and control of bacterial infection in dental spray reservoirs. Br Dent J 1963; 115: 413-416. Szymańska J. Antifungal efficacy of hydrogen peroxide in dental unit waterline disinfection. Ann Agric Environ Med 2006; 13: 313-317. Shearer BG. Biofilm and the dental office. J Am Dent Assoc 1996; 127: 181-189. Williams JF, Molinari JA, Andrews N. Microbial contamination of dental unit waterlines: origins and characteristics. Compend Contin Educ Dent 1996; 17: 538-540, 542 passim. Pankhurst CL. Risk assessment of dental unit waterline contamination. Prim Dent Care 2003; 10: 5-10. Yoon HY, Lee SY. Bacterial contamination of dental unit water systems in a student clinical simulation laboratory of college of dentistry. J Dent Hyg Sci 2015; 15: 232-237. Yun KO. Actual status of infection control by the dental hygienist in Korea. J Korean Soc Dent Hyg 2013; 13: 369-376. Robert A, Bousseau A, Costa D, Barbot V, Imbert C. Are dentists enough aware of infectious risk associated with dental unit waterlines ? Bull Group Int Rech Sci Stomatol Odontol 2013; 52: e29-34. Mills SE. The dental unit waterline controversy: defusing the myths, defining the solutions. J Am Dent Assoc 2000; 131: 1427-1441. Depaola LG, Mangan D, Mills SE, Costerton W, Barbeau J, Shearer B, Bartlett J. A review of the science regarding dental unit waterlines. J Am Dent Assoc 2002; 133: 1199-1206. Lee YS, Kim YB, Kim KS, Han HG. Disinfection properties and variation in the ozon concentration in seawater generated using a low-temperature dielectric barrier discharge plasma reactor. J Environ Soc 2012; 21: 1181-1186. Hironori A, Katsuhisa K, Satoshi H. Plasma generation inside externally supplied Ar bubbles in water. Plasma Sourc Sci Tech 2008; 17: 1-6.